Arabian philosopher; born in Farab, Turkestan, about 870; died in Damascus about 950. He studied at Bagdad, then the seat of Greek philosophical learning, and traveled in Syria and in Egypt. The influence exerted by his philosophical works impressed itself permanently upon Jewish literature. Some of his writings are extant only in their Hebrew versions. He is the author of many essays on the "Logic" of Aristotle, of an introduction to his "Metaphysics," and of commentaries on his "Physics" and "Nikomachean Ethics." 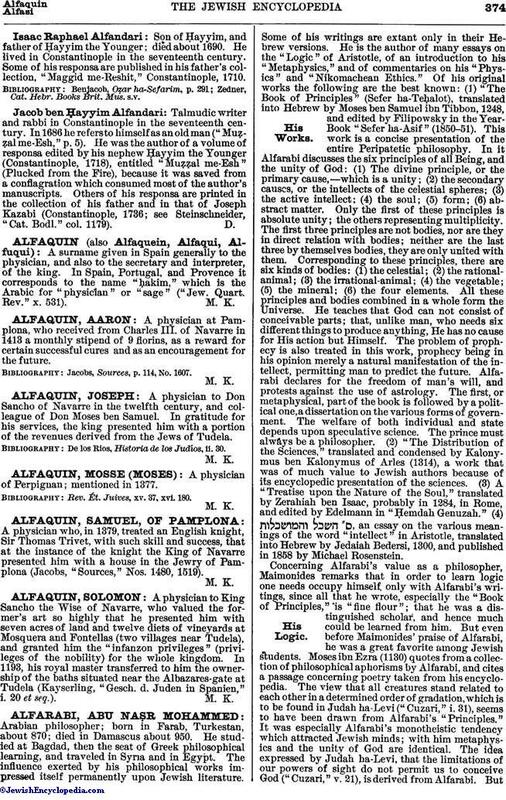 Of his original works the following are the best known: (1) "The Book of Principles" (Sefer ha-Teḥalot), translated into Hebrew by Moses ben Samuel ibn Tibbon, 1248, and edited by Filipowsky in the Year-Book "Sefer ha-Asif" (1850-51). This work is a concise presentation of the entire Peripatetic philosophy. In it Alfarabi discusses the six principles of all Being, and the unity of God: (1) The divine principle, or the primary cause,—which is a unity; (2) the secondary causes, or the intellects of the celestial spheres; (3) the active intellect; (4) the soul; (5) form; (6) abstract matter. Only the first of these principles is absolute unity; the others representing multiplicity. The first three principles are not bodies, nor are they in direct relation with bodies; neither are the last three by themselves bodies, they are only united with them. Corresponding to these principles, there are six kinds of bodies: (1) the celestial; (2) the rational-animal; (3) the irrational-animal; (4) the vegetable; (5) the mineral; (6) the four elements. All these principles and bodies combined in a whole form the Universe. He teaches that God can not consist of conceivable parts; that, unlike man, who needs six different things to produce anything, He has no cause for His action but Himself. The problem of prophecy is also treated in this work, prophecy being in his opinion merely a natural manifestation of the intellect, permitting man to predict the future. Alfarabi declares for the freedom of man's will, and protests against the use of astrology. The first, or metaphysical, part of the book is followed by a political one, a dissertation on the various forms of government. The welfare of both individual and state depends upon speculative science. The prince must always be a philosopher. (2) "The Distribution of the Sciences," translated and condensed by Kalonymus ben Kalonymus of Arles (1314), a work that was of much value to Jewish authors because of its encyclopedic presentation of the sciences. (3) A "Treatise upon the Nature of the Soul," translated by Zerahiah ben Isaac, probably in 1284, in Rome, and edited by Edelmann in "Ḥemdah Genuzah." 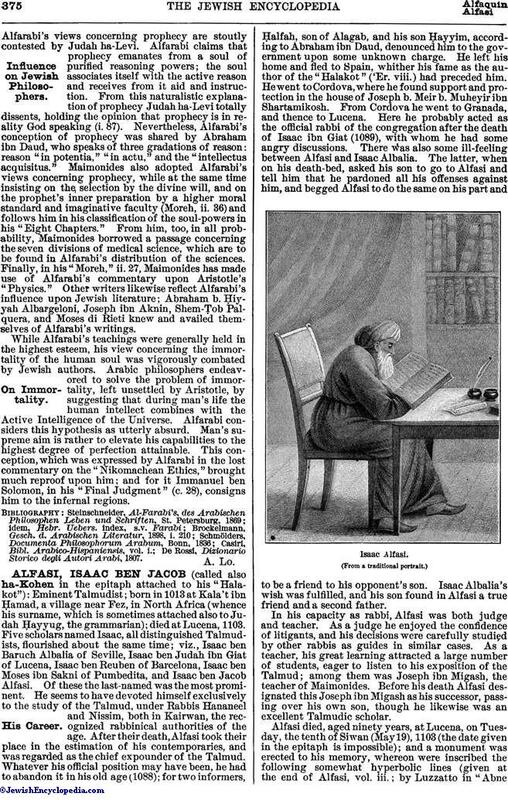 (4) , an essay on the various meanings of the word "intellect" in Aristotle, translated into Hebrew by Jedaiah Bedersi, 1300, and published in 1858 by Michael Rosenstein.